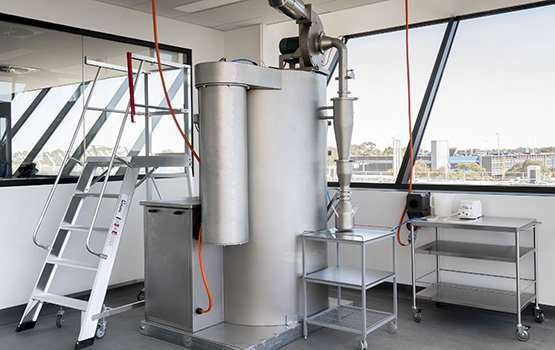 A suite of drying technology platforms developed by researchers at Monash University could help extend the shelf life of Australia’s powdered dairy exports – including infant formula – while meeting stringent safety and quality benchmarks. Professor Cordelia Selomulya and her team from Monash University’s Department of Chemical Engineering, along with international collaborators, have developed world-first ‘Smart Drying’ technology to help optimise the current industry-standard spray drying conditions and their effect on the final powdered dairy products. Spray drying is a method of producing a dry powder from a liquid or slurry through rapid drying with hot gas. Prolonged storage and continued exposure to temperature and moisture during transportation can lead to the browning / caking and spoilage of dairy powders. Above all, this can impact the solubility of dairy powders which, in the case of infant formula, can cause choking. Professor Selomulya says the use of X-ray diffraction and infra-red technology as part of the study will be able to monitor fundamental changes in powder properties during storage and can assist in understanding the ideal conditions that produce cost-effective, export quality dairy powder. “Milk powder production is the most energy-intensive dairy manufacturing process, with Australian producers under increasing pressure to improve efficiencies and to reduce the cost of bulk powder production,” Professor Selomulya said. “As most infant formulas are exported overseas, it is important that the quality is maintained during the transport and storage period. This could take several weeks or months before the customer uses the product. Roughly 40 percent of fresh milk in Australia is spray dried to create products such as milk powders, whey powders and milk protein concentrates which collectively make up half of Australia’s $2 billion dairy export industry. With a growing demand for dairy products in Southeast Asia, Monash University research will help to define the right process conditions to produce these powders and also help extend their shelf life. “The Australian dairy industry has the reputation of producing high quality products and Australia has one of the highest food safety standards in the world. The key is now to be able to increase efficiency in manufacturing by decreasing the chances of producing dairy powders with poor quality shelf life,” Professor Selomulya said.